(Nanowerk News) Researchers have proposed an efficient and stable dual-phase lithium metal anode for Li-S batteries, containing polysulfide-induced solid electrolyte interphase and nanostructured graphene framework at Tsinghua University, appearing on ACS Nano ("Dual-Phase Lithium Metal Anode Containing a Polysulfide-Induced Solid Electrolyte Interphase and Nanostructured Graphene Framework for Lithium–Sulfur Batteries"). Among various promising battery candidates with high energy densities, Li-S batteries, with a high theoretical capacity of 1675 mAh g-1 (based on sulfur) and an energy density of 2600 Wh kg-1 (based on the Li-S redox couple), are highly considered. "The superior property prompts the tremendous potential of Li-S batteries in portable electronics, electric vehicles, and renewable energy harvest," said Dr. Qiang Zhang, an associate professor at Department of Chemical Engineering, Tsinghua University. "Despite these advantages, many obstacles still need to be overcome for practical applications of Li-S batteries, such as the low conductivity of sulfur, the shuttle of long-chain polysulfide intermediates in the sulfur cathode and Li dendrite issues in the Li metal anode. Relative to the wide research in the cathode and electrolyte, Li metal in the anode has obtained few attentions." The formation of Li dendrites is a primary issue for Li metal batteries including Li-S batteries, which always leads to serious safety concerns and low Coulombic efficiency. Li dendrites are among the toughest issues of Li metal anode, however, it is not the exclusive one. Researchers form Pacific Northwest National Laboratory discovered a novel failure mechanism of Li metal anodes, that the porous interphase of the anode grew inward toward the bulk (fresh) Li metal, which evolved into a messy and highly resistive layer and, thus, resulted in huge transfer resistance and a great amount of Li metal losing contact with electrons (dead Li) in the inert layer. Before the dendrite-induced short circuit, the impedance of the battery escalated sharply and the service life was terminated early. "In a Li-S cell, this phenomenon is more frequent and serious, because sulfur and lithium sulfide products are both ion- and electron-insulating and the cross-coupling effect will lead to a sharp decrease in the voltage and energy density. 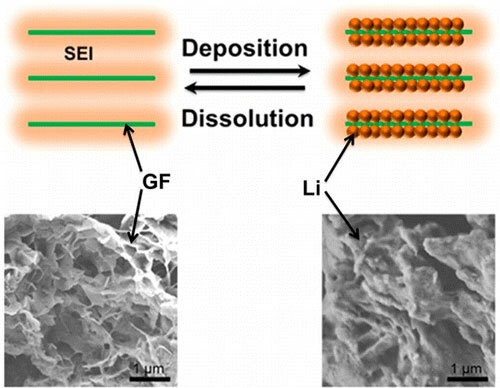 Consequently, it is critically important to design an anode structure with desirable electron and ion channels to improve transfer properties and recycle dead Li in a Li-S cell," Qiang told Nanowerk. Based on this concept, Xin-Bing Cheng, a graduate student and the first author, proposed a nanostructured graphene framework with Li depositing to be a high-efficiency and high-stability Li metal anode for Li-S batteries. In a routine configuration of Li metal anode without graphene framework, Li dendrites easily grew on routine 2D substrates (such as Cu foil). As the root of dendrites can receive the electron easily and then dissolve earlier, Li dendrites easily fractured and were detached from the substrate to form dead Li. If there is a pre-existed conductive framework such as self-supported graphene foam, the deposited Li will be well accommodated. 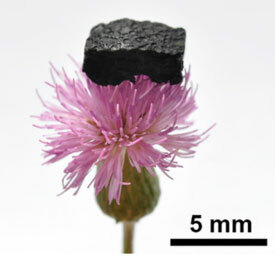 Free-standing graphene foam affords several promising features as underneath layer for Li anode, including (1) relative larger surface area than 2D substrates to lower the real specific surface current density and the possibility of dendrite growth, (2) interconnected framework to support and recycle dead Li, and (3) good flexibility to sustain the volume fluctuation during repeated incorporation/extraction of Li. "We hope that the wise combination of the nanoscale engineering and electrochemistry can help improve Coulombic efficiency and ion conductivity of Li metal anode for the applications of Li-S batteries," said Xin-Bing. Future research is required to investigate the diffusion of Li ions before and after crossing the SEI. The results indicated that nanoscale interfacial electrode engineering could be a promising strategy to tackle the intrinsic problems of lithium metal anodes and the concepts described herein shed a new light toward high-energy-density LMBs, such as Li-S and Li-O2 batteries.